Tuiles are traditionally a French wafer biscuit served with a dessert but the word tuile is now used to describe any crispy part of a dish, be it sweet or savoury. Often now made with isomalt (a type of sugar) to ensure a good snap, the first tuiles were a thin biscuit made of flour, eggs and sugar, sometimes with the addition of almond meal. The mix would be spread thinly onto a baking mat, baked until golden brown and folded over a rolling pin whilst still warm to form the traditional curved shape. 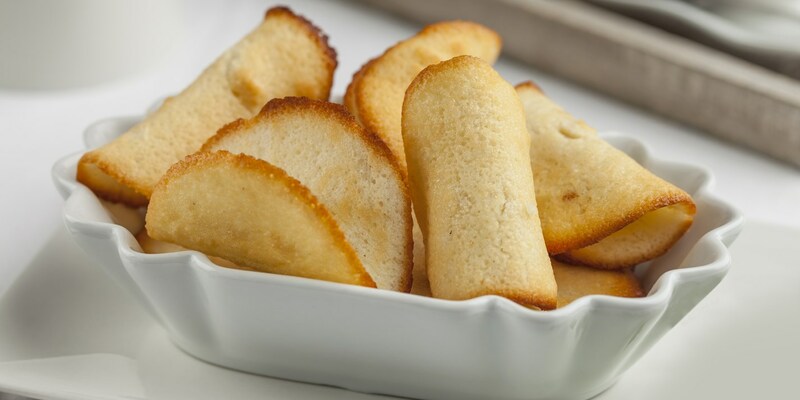 To enrich the tuile try adding 50g of melted butter to the mixture. You can also add nuts such as flaked almonds and pistachios or even a little cocoa powder. Adam Simmonds makes a Cranberry tuile and pipes in a stilton foam for an unusual canapé, while Kevin Mangeolles garnishes his Compressed tomato with crab and horseradish granita with a crab tuile. Laurie Gear makes a Macadamia nut tuile to serve with his chilled rice pudding.